June 23, 2010 - Rescuers have located the wreckage of a crashed plane that took off from Yaounde, the capital of Cameroon carrying an Australian billionaire mining tycoon, Ken Talbot and five other board members of Sundance Resources. On Saturday the twin turboprop Casa C212 airplane crashed into think jungle in Dima about 20 miles from Yangadou in Congo-Brazzaville which boarders with Cameroon in West Africa, all 11 passengers were killed. 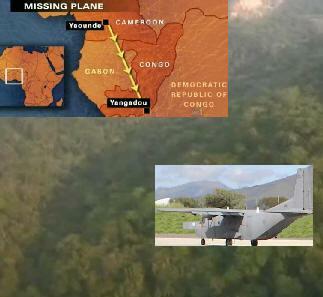 The twin turboprop Casa C212 was transporting the entire six board members of Australian?s Sundance Resources mining company to Yangadou. Onboard were six Australians, two British, two French and one US national when the plane crashed. George Jones, Sundance's ex-chairman had said the board had shared the flight as a result of Talbot's private jet was unable to make a landing at the airstrip at Yangadou, a small mining town because the airstrip was too small to land a jet on. "It's unusual for an entire board, it actually breaches corporate governance and obviously relates to the fact they could only get on one plane." The twin turboprop Casa C212 had been chartered by Sundance Resources to travel to West Africa with key company officials to visit an iron ore facility that spans between Cameroon and Congo. The company was looking to expand operations. Revenues from this project is said to be worth in the billions of dollars and would provide long term employment to the region. The mining industry has allowed Australia to flourish economically and because of the death of Ken Talbot and the deaths of so many key employees at Sundance Resources has captured world attention. In August of this year Talbot was to stand trial on alleged corruption charges in which state officials believe he was involved in bribing a former minister in the Queensland state government. The aircraft flight recorder has been recovered, although Australian authorities say it is too early to say what caused the crash. Cameroonian Communications Minister Issa Tchiroma Bakary confirmed the wreckage of the twin turboprop Casa C212 and that there were no survivors. Rescue efforts had been hampered by weather and tracking into the jungle. Recovery personnel had to cut their way through the jungle to get to the crash site. Sundance had halted its African operations and requested its workers assist in the recovery efforts. Company officials have warned family members it may take days before they will be able to get the bodies out of the jungle. French military C-160 transports and Cougar helicopter were used to assist in locating the crash site. Australian, French, American and Canadian personnel provided assistance. Ken Talbot (1951 ? 20 June 2010) was the principal shareholder and former CEO of the Macarthur Coal Ltd mining company. Talbot temporarily stood down as the CEO of the Macarthur Group Companies when he became embroiled in a controversy involving loans to controversial Labor MP Gordon Nuttall, who was jailed for corruption in July 2009. At the time of his death, he was a shareholder in Western Australian mining company Sundance Resources. His personal worth was estimated by Business Review Weekly at $AU965 million. On 19 January 2007, the Queensland Crime and Misconduct Commission charged Talbot with corruptly making payments totaling close to $360,000 to Nuttall. He was due to face court in Brisbane on August 30, 2010 on 35 charges relating to corruption.